The third Cluster Walk in April 2010, followed a circular route starting and finishing at the Basket Range Memorial Hall – which ultimately provided a welcome refuge from the late showers on an otherwise fine day. As with previous walks a large group of landholders, their families and friends took part. For those interested in local history as well as revegetation and land management issues, this walk which centred on the heart of the original settlement of Basket Range, provided a unique insight into the challenges faced and the aspirations of the families who settled this area around the end of the 19th century, many of who are still represented by their descendants in the community today. Meg and Andrew Burdett hosted our first stop at their wonderful garden at Amburwood on the east side of Burdetts Road. This house and garden was established in 1916 by Andrew’s grandfather, Alfred Burdett. As we admired stunning views from the house and across the valley and the diversity of the planting, we appreciated that the beauty of this area is a tribute to the successive generations of Burdetts who have loved and cared for it. Patricia Michell (nee Bishop) then led us down Burdetts Road past the original Burdett house beside an enormous Canary Island Pine. Now called Hillgrove, Meg runs this house as a Bed & Breakfast. Further down the road past a few more Burdett properties, Patricia took us to see “The Wildflowers”, now owned and recently renovated by herself and her husband Edwin. The house was built in 1911 by William Burdett, son of the original Burdett and brother of Alfred. At the northern end of the property we walked through part of the memorable Burdett Wildflower Garden. Although now rather overgrown, as one of the earliest collections in existence of wildflowers sourced from across Australia and overseas, this heritage listed garden is a special part of Basket Range history and demonstrates that, from its earliest settlement, the area attracted intrepid souls with a love of plants and nature. From the Wildflower Garden we headed across country into Belle Trees. Many of us would have admired this property from Knotts Hill Road. It was established by Jenny Dillon (nee Burdett) and her late husband in the 1990’s. 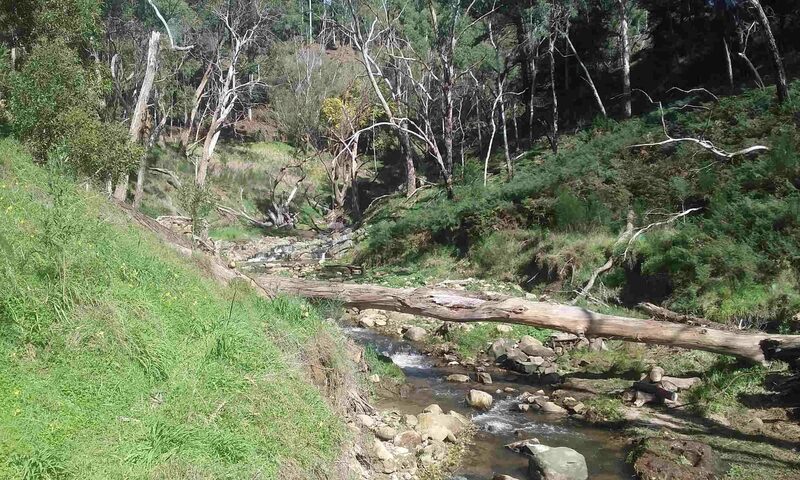 Walking through it provided an entirely new perspective of a beautifully maturing garden, now cared for, along with a not insignificant stretch of riparian vegetation and bush, by its new owners, Patricia and Edwin Michell. We were moving too slowly for Doug and Mary Fletcher who decided to find us with a delicious morning tea by driving into Belle Trees rather than waiting to meet us at Burdett Bridge as originally planned. They made a grand entrance! Suitably refreshed the Group split with some making their way back up to the Memorial Hall via Burdetts Road, while others pressed on up Hunters Road. This second half of the walk concentrated on the more central and familiar themes of revegetation and landcare. Several walked with Patricia via the old track on the bald hill known as Alley’s Knob, which is now Bishop land, while others stuck to the main road, as we made our way to the Waterfall on Hunters Road. Huge piles of cut limbs are testament to the extensive willow removal undertaken by the Group last year at the Falls. Evidence that one must break eggs to make an omelette! Revegetation work next year (and a few winter bonfires) should significantly improve the appearance of this very visible site. At the top of Hunters Road those who were able to take the opportunity to inspect the gentle (largely manual) weed removal and revegetation work that Joe Frank has carried out over the last 20+ years and listen to him talk were both inspired and daunted by his persistent efforts and the results evident in this peaceful stretch of creek. From the Frank’s property a slow uphill stroll along Lobethal Road followed, past Felicity Playford’s community vegetable garden, the Cranwell old family home with native ferns reappearing and finally to the School to admire the work of the Basket Range Landcare Group restoring native bushland between the School and the Memorial Hall. The walk finished with a by now traditional barbecue, some local wines and talk of the next walk. With so many interesting and inspiring properties still left to explore and learn from, all present agreed that the Cluster Walks must continue!